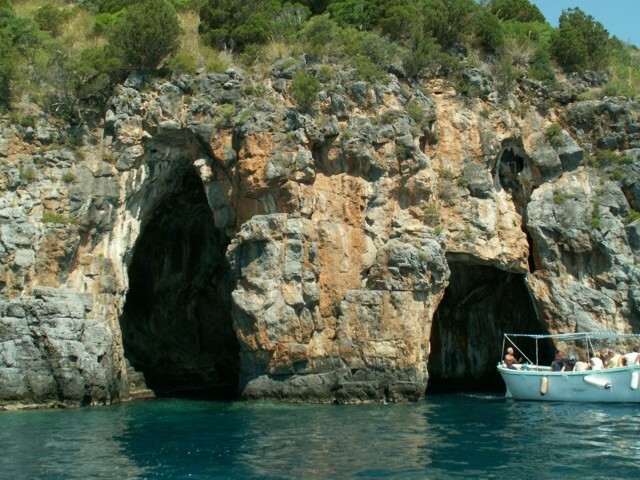 The Geopark is located in the province of Salerno, Campania and occupies the whole of the territory of the National Park of the Cilento and Vallo di Diano. 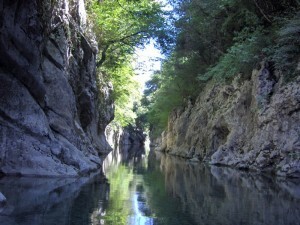 The Park extends from the Tyrrhenian coast to the margin of the Lucania mountains. The Geopark constitutes one third of the Campania coast and is characterized by gentle northern and more irregular southern landscapes (figure 1). This strong morphological contrast is attributable to the distinct bipartite nature of the geology and to the area’s long evolutionary history. 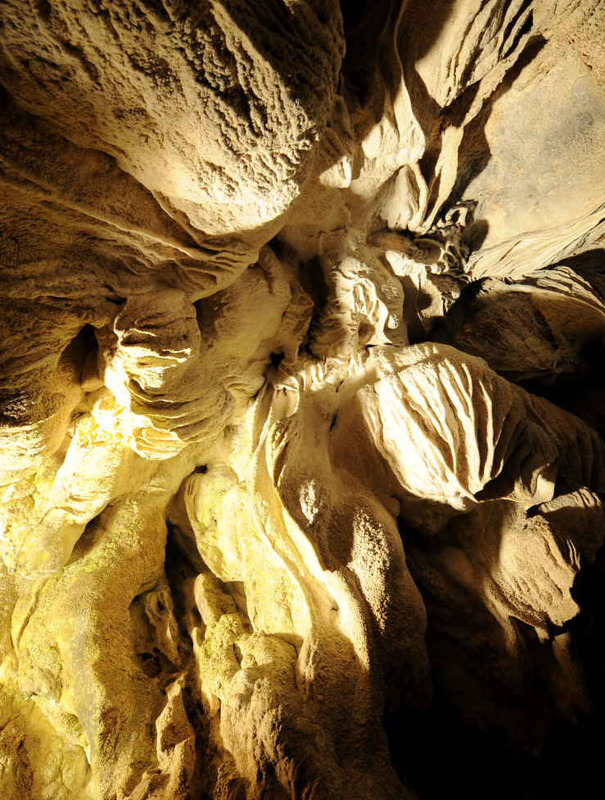 Carbonate massifs within the Geopark are characterized by karst features including caves (figure 2), vast plateaus with dolines and polje separated by slopes sculpted by intense neo tectonic activity and dissected by deep gorges and canyons (figures 3 and 4). The upper arenaceous conglomerate component of the “Flysch of the Cilento” (Auctorum) exposed at the surface on Mount Stella, Mount Gelbison (figure 5) and Mount Centaurino and the underlying clayey marly component are associated with the hilly reliefs of Velia, the Mingardo and Bussento This landscape was sculpted primarily through stream erosion and by slope processes. In this Geopark various categories of geosites were distinguished based on their stratigraphical, geomorphological, paleoenvironmental, structural, hydrogeological and paleontological significance. Geosites also include sites with particular panoramic (scenic sites) or economic (ancient mines) value. The size and geodiversity of the territory of the Geopark are matched by the variety of important ecosystems. 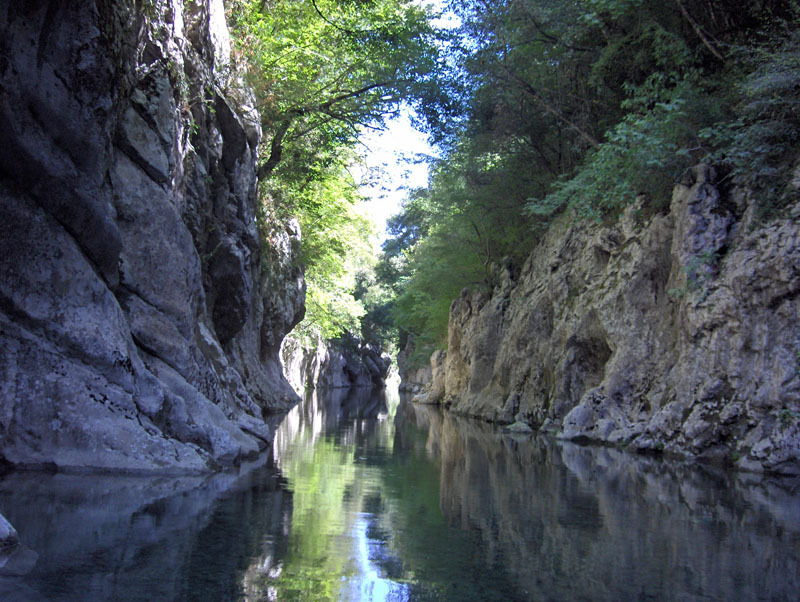 A large part of the Geopark’s territory coincides with the Reserves of the Biosphere the National Park of the Cilento and Vallo di Diano which has been included in the UNESCO list of World Heritage Sites since 1998. The majority of geosites occur within the UNESCO site. from the Calabrian city of Sybaris. The city of Elia (Velia) was founded by Greeks around 540 BC and became the home of the Eleatic School of philosophers. The city was abandoned in medieval times. Padula Charterhouse, a Carthusian monastery, at the foot of Mount Maddalena was founded in 1306. It is the second largest Charterhouse in Italy and is a UNESCO World Heritage Site. Historically significant villages include the abandoned suburbs of Roscigno Vecchio and S. Severino (figure 6). 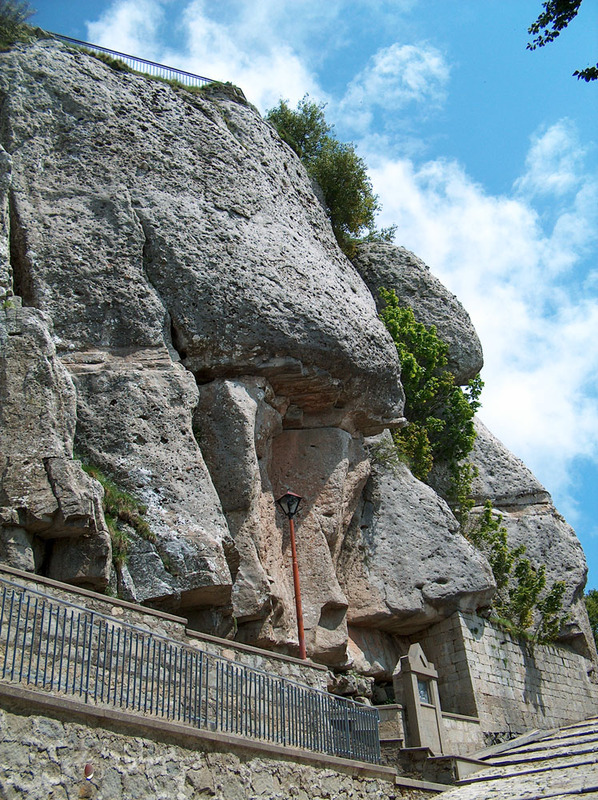 Sites of religious significance such as the Sanctuary of the Madonna of Novi on Mount Gelbison are set in spectacular landscapes. The Geopark has benefited from earlier National Park projects and includes and extends the results of these projects in its activities. “The ecological network for local sustainable development”, financed with the funds of the POR Campania 2000 -2006, protects the natural environment and historical and cultural resources, strengthens the provision of services and promotes sustainable development. The National Park has also managed European funded projects including: Life Nature. “Management of the net of SIC / ZPS in the Park” and INTERREG projects associated with integrated tourism in rural areas (INTERREG III B), the East Mediterranean Network for the sustainable development of protected areas (INTERREG III B), and new strategies and tools for the development of entrepreneurship in the marginal rural areas (INTERREG III C). The project Area Brands promotes and sustains productions, activity and services concerned with the improvement of environmental and socio-economic quality. The Geopark has a network of trails of approximately 1500 km with signage in accordance with the strictures of the Italian Alpine Club. These trails are partly equipped with educational panels, a system of signs and rest areas. The Geopark also contains a network of approximately 41 museums devoted to archaeology, geology and paleontology and the history and development of civilization. The presence of the sea is not ignored and its marine life is displayed in an aquarium.